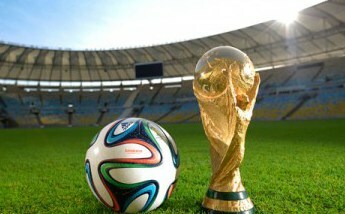 My dear football friends, 2018 FIFA World Cup is coming around the corner! In case you are so occupied and can't make time leave for Russia, you possibly become a couch potato to watch 2018 FIFA World Cup video via TV set indoor. Well, an even greater choice you may miss is that watching 2018 World Cup video on iPhone iPad without being glued to TV set for every second of action. That being said, how to enjoy FIFA World Cup video on iPhone iPad really makes you scratch head. Take it easy! In this fast-developing society, only you can not think of things, no impossible things. You can download and watch 2018 World Cup videos, matches, highlights on iPhone iPad offline with third-party help, or watch Russia World Cup live stream using free sports apps for iPhone iPad without subscriptions to a cable or satellite service. Head below for the full guide and do not miss out any 2018 World Cup highlights. Here MacX Video Converter Pro, which is exactly made for you to fix this issue, for it can aid you to easily download and convert 2018 World Cup video even in 720P, 1080P, 4K HD from YouTube, Dailymotion, Facebook, Sports.hdtv, starsports, Myspace, and another 300+ sports video sites. After trouble-free downloading Women's World Cup video, it can also download World Cup theme songs to iPhone iPad accepted video format like MP4, H.264, MOV, M4V, MP3, AAC, iPhone Ringtone with blistering speed and meanwhile keeping maximum high quality. Then watch female's world cup match video, go ahead! Free download FIFA World Cup 2018 video song downloader for macOS or for Windows, run it. Click "YouTube" button, copy and paste the World Cup 2018 video URL to the type box. then click Analyze button to load the source video, and select the video res, format, file size you want from the popping up window, and click OK to save the settings and go to the next step. Click "Browse" button to choose a place for downloaded World Cup video to save in for later syncing to iPhone iPad. Click Download Now button at the bottom to process downloading 2018 World Cup videos for offline watching on iPhone iPad. How about downloading World Cup theme songs to iPhone iPad? Here we go. If the source World Cup videos are formatted MKV, AVI, WMV etc. unaccepted by iPhone iPad, you can also the tool to convert MKV, AVI, WMV, H.264 to iPhone iPad format MOV, MP4, HEVC etc. Use tips below. Tips: Before downloading World Cup video, users can select "Auto add to convert list" for further FIFA World Cup YouTube video conversion. Remember to close the YouTube Downloader window, and the downloaded video will be automatically added to the conversion list. After the World Cup download process is completed, an output format window will appear, allowing you to select format for iPhone iPad. Choose "to iPhone" or "to MP4" (recommended) as output format. MacX Video Converter Pro is an all-in-one video converting solution integrated with SD and HD video format conversion, you may also use this program to convert World Cup 2018 YouTube video to MP3, iPhone ringtone, or iPhone X/8/7/6s/6/6 Plus, iPad Air 2/mini 4 Retina video format, or Android device like Samsung Galaxy S8/S7(Edge)/S6, Kindle Fire, HTC M10, etc. without third party tool assistance. When the conversion is done, you can transfer World Cup video to iPhone iPad with video transfer tool and finally watch 2018 FIFA World Cup video on iPhone iPad anywhere anytime you like. Tip: best YouTube downloader also supports among a glut of HD & SD video formats, including MKV, M2TS, MTS, AVCHD, H.264/MPEG-4 AVC, AVI, MPEG, MP4, WMV, MOV, FLV, RM, WebM and a lot more. Even if you intend to make photo slideshow of the World Cup exciting moments or extract World Cup theme song from video, this video converter totally leaves the choice on you. Fans can watch 2018 World Cup live videos on iPhone iPad via iOS free sports apps without subscriptions to a cable or satellite service- never miss any big World Cup 2018 moment and stream live video of the Russia World Cup on iPhone iPad Apple devices without waiting if you have good Wi-Fi connection. We never lack such apps, and the most popular options are listed below. Check the file size and compatibility first before you download the app on iPhone or iPad. iDevices running old version of iOS may fail to support some apps. The official app of FIFA is the must-have app for football fans to watch World Cup videos without cables on iPhone iPad. The app will keep you up to the date with the latest World Cup scores, videos, and interviews. It is updated frequently with some bugs fixed and performance improved. But check the reviews of the new version before updating because some users are crying that the new update is horrible. The best app lets you watch World Cup live videos on iPhone iPad, including World Cup highlights, news, analysis, goals etc. Users are offered access to many live streaming feeds from ESPN, ESPN2, SEC Network, ESPN Goal Line. It offers good user experience, allowing fans to replay, rewind, fast or back forward smoothly. However, it's ads supported and you need to sign into a supported cable provider in order to stream live World Cup videos on iPhone iPad. Livestream: Size - 131.3MB, Rating - 3.5, Compatibility - iOS 9 or later. BBC Sport: Size - 83.1MB, Rating - 4, Compatibility - iOS 9 or later (for fans who live in the UK). Yahoo Sports: Size - 162.2MB, Rating - 4, Compatibility - iOS 9.3 or later. There are lots of sites to watch Russia FIFA World Cup live streams or replays on iPhone iPad without the need to download extra applications, register or subscribe. Most World Cup video sites come with geo-restrictions. You have to use a VPN service if you are blocked. 1. 2018 FIFA World Cup Russia official site - highlights, the latest matches. 2. YouTube FIFATV channel - full matches, goals, highlights, best moments, most-viewed World Cup videos. 3. Fox Sports for watching live match streaming on iPhone iPad, available in the US. 4. NBC Sports for World Cup live streams in Spanish, available in the US. 5. WatchESPN for fans who live outside of Canada and US. 6. Optus Sports for World Cup fans located in Australia. MacX YouTube Downloader helps download FIFA World Cup 2018 videos, highlights, theme song videos, match video, etc. from YouTube, Facebook, Dailymotion, Myspace, Vimeo, etc. 300+ sites for offline playback on iPhone, iPad, Android, HD TVs etc. Watch World Cup on iPhone X/8/7/6S/6 etc.